The town's history is mirrored in its past, and nothing is more exacting in recording the past than the record of it’s deaths. 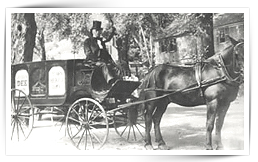 The long history of Dee Funeral Home & Cremation Service has been indelibly entwined with our community’s history for over a century. Located in the shadows of historic Sleepy Hollow Cemetery and on the ground trod by the Minute Men of 1775, the firm has been witness and partner to the town’s history ever since 1868. The firm has been of service to the Emerson, Alcott, Hawthorne and Thoreau families and many generations of Concordians and residents of surrounding towns. Many traditions have been implicit in the firms operation since its founding, and each succeeding generation of Dees has continued the practices of the past while adapting to the needs of the present, providing quality and caring services for all families served. Joseph Dee Jr. became associated with Farrar in 1893. A native of Lincoln he came to Concord at a young age. Mr. Dee operated the funeral home as well as a flourishing farm, Peter’s Spring Farm on Bedford Street, Concord. Joe was well known and highly esteemed. He was an able and energetic businessman, genial, generous and always ready with a cheery and encouraging word or with some quip or clever turn of speech. Joe was held in high esteem by a large group of friends and associates. He also served the town as Burial Agent, Registrar of Veterans Graves and a member of the Sleepy Hollow Cemetery Commission. Following the death of his beloved wife Elizabeth he raised nine children, eight boys and one daughter. Three of their sons were licensed funeral directors, James, William and Francis. James H. Dee joined his father, Joseph, in the business in 1913 after graduating from the New England Institute of Technology. A lifelong Concord resident and a Funeral Director for fifty-seven years, he served as town Burial Agent and Registrar of Veterans graves. During World War I, he served as a Sergeant in France with Concord’s famed 26th Yankee Division, Company I. Jim was an avid railroad enthusiast and musician. He played the piano and the clarinet with the Concord Legion Band in addition to raising five children with his wife Agnes. A third generation funeral director, Charlie began employment in 1948 following his graduation from New England Institute in Boston. He joined his father, James Hugh Dee, and grandfather, Joseph Dee, Jr., in the business following his service in the U.S. Army Air Corps, Eighth Air Force, during World War II. Charlie was the recipient of six Bronze Battle Stars during his years of military service. The French Government honored the 801st/492nd Eighth Air Force Bomb Squadron with the Croix de Guerre Citation for their military service. He served the Town of Concord in many capacities over the years, including, Burial Agent, Chairman and longtime member of the Sleepy Hollow Cemetery Committee, Registrar of Veterans Graves, Chairman of Parks and Monument Committee, Past President of the Concord Rotary Club. He also served on the Board of Directors of the Massachusetts Funeral Directors Association. In 1997, he and his late wife, Nancy were selected as Concord's Honored Citizens. He was a lifelong Concord resident, and was the father of three children, Sherry L. Mobley, Susan M. Dee and Charles W. Dee, Jr., 5 grandchildren and 6 great-grandchildren.